CryptoGames.io is all about the fun of online Bitcoin gambling. Launched in June 2015 the site boasts of Provably Fair games, a no registration process, a low house-edge, instant payouts and being able to bet as little as 100 Satoshi. If it sounds too good to be true it’s not. This is exactly what gamblers get when betting with CryptoGames.io! Their interface is bright and fun with a feeling of joviality. Yet it is also well designed and clearly set out making it easy to use regardless of a players experience. The site also offers a great variety of Bitcoin games to cater to the fun side of the gambling community. Being able to play such a variety of games with a variety of cryptocurrencies, makes this one of the most widely accessible Bitcoin Casinos around. The games on offer a new spin on some old classics which will invoke some nostalgia while enjoying fast-paced Bitcoin winning action. The cherry on the cake is an amazing Bitcoin faucet opportunity that provides bitcoins every 3 minutes. The slots games include two 5-wheel games, being Stellar Slots and Tropical Dreams Slots, each with up to 20 paylines each and jackpots pays up to 5,000x. 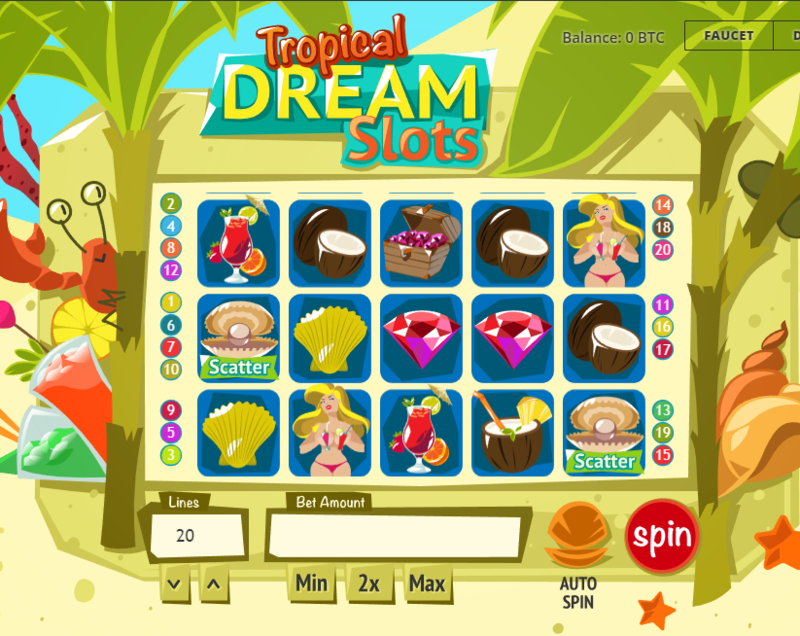 The other slots game is the classic 777 Slots and offers a simple 3-reel game with a 1,000x maximum jackpot payout. The dice game is basic with a clean interface. It has a 125% bonus and a faucet backup. You can set a limit on your automatic rolls. Minesweeper offers a choice of five sizes with a 9x reward to complete. Wheel of Fortune is in three versions with a 3x or 2x winnings option. Mobile players can access CryptoGames.io anywhere and anytime on any device including iPhone, Android as well as on a desktop. Gamblers should always ensure their software is updated in order to have the best gambling experience on all devices. Another great feature is that the games’ RTP (return to player) percentage can be checked in the Help section. CryptoGames offers a great ‘fun money’ feature whereby players are able to start playing for free until they decide they got the hang of all the fun on offer. Fun Money can be used on all the games available on the site and visitors will be given 1000 Fun Money immediately. These wins will not be credited to your general account. CryptoGames.io has a Bitcoin faucet that gives away free BTC at regular intervals. A good way to earn some free Bitcoin, or to have fun without using your own Bitcoin! To play at CryptoGames.io, players have the option of depositing Bitcoin, Dogecoin, or Litecoin making Cryptogames.io a multi-currency casino. When playing at CryptoGames.io there is no need to register. When entering the site, visitors will automatically receive a personal ID username and it can be saved to the user’s internet browser cookies. The ID can be saved via Game Settings and used for playing from another device or using another internet browser. When depositing gamblers choose a cryptocurrency of their choice from the ones on offer and click the Deposit button. A wallet address will be given to which you can deposit the required amount of currency. There don’t seem to be any deposit limits. Withdrawing is just as easy. By clicking on Withdrawal option, gamblers will provide the casino with a Bitcoin wallet address and amount to be taken out. There is a minimum withdrawal amount of 0.002 BTC. Should players take out more than 2 BTC within 24 hours, it could take up to three days to process. Keep in mind that there is a withdrawal commission of 0.0005 BTC. The minimum withdrawal amount is 0.002 BTC, 0.2 LTC, and 10,000 DOGE. The site also has withdrawal charges set at 0.0005 BTC, 0.002 LTC, 1 DOGE. There seems to be no mention of CryptoGames.io have any scam accusations and from what we have seen and the fact that it has been around since 2015, CryptoGames is a legit casino that offers a great service to the casino industry. TheBitcoinStrip has verified the authenticity of CryptoGames.io’s provably fair mechanism. Provably fair casinos offer solid player protection over standard casinos as the player can verify that every bet outcome is legitimate. CryptoGames Casino has a Provably Fair section with explanations and instructions on the fairness of all of their games. They also have a Verify section in which you fill out fields for the games, server seed, client seed, nonce, and result. This makes for the ultimate in secure gambling. To get hold of the team there is also a Contact Us section for you to send an email message or inquiry. CryptoGames.io also has a chat interface embedded into in. In the chat feature, online users can interact with one another, making for a social environment. CryptoGames.io oozes fun and excitement. Nostalgia and modern gaming come together to provide a great variety of games to the cryptocurrency gaming community. These guys are all about being provably fair, offering fantastic jackpot payouts all while being fully available to sort out any queries or concerns from the visitors who seem to flock back time and time again, proving this to be a site for return Bitcoin players who enjoy the professionalism. CryptoGames.io does not currently offer any Bitcoin bonuses to its players!